The town of Rathdowney is located in an area of south-east Queensland, Australia that was first explored by Captain Logan in 1828. The area was opened up for settlement in 1842. Thomas Lodge Murray-Prior purchased a large freehold portion in 1876, which he named Rathdowney Station after the Murray-Prior estates in Rathdowney, Ireland. The property passed to William Collins & Sons in about 1880 and the land was further broken up; the township being formed about 1910. Four major industries have influenced the growth of the town. The Tramway (a small railway line) was extended to Rathdowney from Beaudesert in 1911. This service was important to the district as it not only enabled the delivery of timber and cream from the area but was also used as a passenger and postal service. The advent of the motor vehicle eventually caused the downturn in tramway use and in 1944 the Tramway was closed. Look on our Museum page to see the tramway station building as it is today. The Sydney to Brisbane Interstate Rail Link was another major influence on the growth of Rathdowney. The first work began in 1926. There was an influx of around 1000 workers, who set up temporary accommodation in tents and shacks. 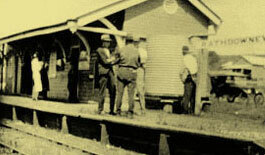 The building of the rail link gave employment to many people affected by the Depression. Conditions were harsh, particularly when flooding isolated the camps. The railway was completed in 1929. Timber cutting was a major industry for the whole of the district. The opening of the Tramway enabled the timber to be moved more quickly to the growing areas outside Brisbane. Bullock or horse teams had been used in the past. There were many timber mills throughout the district namely, Palen Creek, Tylerville, Glenapp, Tamrookum Creek, Oakey Creek, and Running Creek. The first electrically operated mill was located at Rathdowney and was responsible for the introduction of electricity to the town in 1947. These mills no longer exist. The other major industry for Rathdowney was dairying. 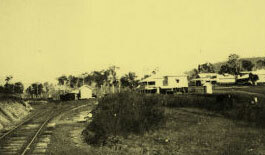 Again, the Tramway facilitated the delivery of cream cans to the Beaudesert Butter Factory. Prior to this, butter had been made at local "creameries". Dairying flourished at this time. Today there are considerably less dairies in number.